Yes it's the first Monday of June asnd it's off to the Market we go! Welcome the 3rd Market Monday at the Etsy Cottage Style Blog! This is a forum where participants come to introduce themselves through thier online selling sights. If you have an Etsy. Ebay, selling blog, or traditional website, you're invited to join in...the more the merrier! It has been a while since Etsy Cottage Style has hosted a swap. With the roses in full bloom right now (and who of us doesn't love roses) it is time to put our creative juices to work with a handmade Summer Roses Swap. For more information and to sign up go to this link. a special spin off group has been set up just for this event! That time again for Market Monday. Best wishes to all who are participating. I have some back inventory I added to my Etsy shop. I have lowered the prices for Market Monday. I linked to my blog in case anyone wants to see more photos of them you can scroll down, or hit the link on the sidebar. Can't wait to check out everyone's beautiful wares! Thank you for the opportunity to share our links---you KNOW there's gonna be some great cottage goodies here!!! Sorry about the two links...I hit send for my blog and then realized that it should be the Etsy link. I have a great Patriotic, 4th of July vintage collage/scrapbooking pack available! I am excited about putting together some new packs with all the goodies I recently got at three flea markets!! Just added my link. Thank you so much for doing this. Thanks so much for the Market Monday opportunity. 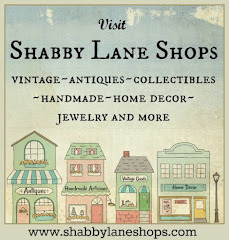 Shabby COttage Studio has lots of fun supplies and even some original art! I just added my link to Cute Art World and I have lowered my prices lower than they have ever been! It shocked most of my collectors so much they started buying all their favorites! Be sure to stop by there is something for everyone! Thanks so much for putting this together! What a lovely idea! I've added both our shops...Trendy Bindi's Boutique and our new vintage Christmas shop, The Vintage Elf. Thank you for letting us share. Good luck to all. Kristi and I (Brenda) just added several new purses to our JoyAnna etsy shop and more stuff to our MorningGloryVintage shop also. Good luck to everyone - I wish you lost of sales. 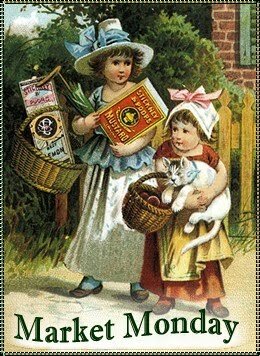 I'm off to look at some "Market Monday" shoppes now! Kristi and I have added several new purses to our JoyAnna shoppe recently and also several vintage items to MorningGloryVintage. Happy to participate in Market Monday and may everyone have a lovely day and many sales. Thank you and I am off to look at some participating shoppes. Yall have a great week!! This is my first time on Market Monday...I'm finding so many new places to shop..thank you! Thanks for hosting this again. I have found some great shops! thank you for hosting this event ..i love flea markets! I especially love this kind of flea market where you can sit in your pj's with a cup of tea and shop! My name is Shari and my Etsy shop is Paperlicious & Other Odities!! I specialize in quality Greeting Cards, Note Cards, Gift Tags and Enclosure Cards, all handmade for all occasions and holidays. Specializing in Tags and Mini Note Cards helpful to all handmade sellers. Items added daily. New directions coming soon! Custom orders always welcome! Please follow me on Twitter http://twitter.com/luvs2create and check out my blog "Creative Chatter" www.creativechatter.blogspot.com if you have time. Wow, this is great. Now I will save up and do more shopping on the first Monday of the month. I so ♥ etsy and have so enjoyed the many wonderful shops I have shopped from. hello there! this is the 1st time i take part of this market, i hope i am doing it well! thanks for inviting me, i'm gonna visit all your links! Wow Everyone! The participation is wonderful! So gald you all could come. Hope we all make some sales this week. So far I've been able to visit some of you and your shops look great. I can't wait to stop you all. The thing with Blogger not working started off and onn last night and it's been doing the same thing all day. Hope they get it fixed. This is my first time adding! Thank you so much for the invite!! I am honored to be with so many great people! What a wonderful way to find new friends and crafters. Thank you for this Monday Market!